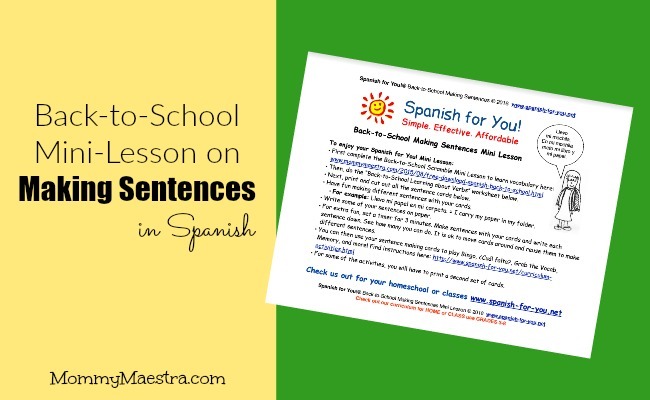 Last month was so busy, I didn't get a chance to post this freebie from our sponsor, Spanish for You! So this month, you'll hopefully get two awesome vocabulary-boosting downloads from them. Starting with this one! This 5-page activity is a mini-lesson on making sentences using back-to-school vocabulary. It comes with a worksheet, sentence cards, and audio file. They teach the students how to build sentences in Spanish and I love that there is the opportunity of endless combinations using the vocabulary cards. In addition, to celebrate the new school year, Spanish for You! is offering a special discount to MommyMaestra readers! Now through September 15th, you can get a free song with every purchase you make. Simply enter the discount code FIESTASONG when you checkout. They now have 10 themed songs and more in the works. They can be found here. They can be used in conjunction with the Spanish for You! curriculum or with thematic units or by anyone whose children are bilingual.